Dog chart cartoon showing dogs with rockets strapped to their backs. Why did I draw this cartoon? It was created to depict the up and down sales of a dog food. I sill like the cartoon because it has a lively look and appearance and speaks for itself. 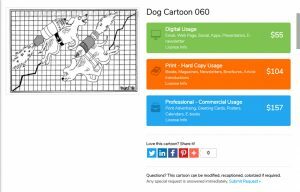 Want to license this dog cartoon? Easy, just click the cartoon that will take you to the page where the cartoon is available for purchase. You choose the payment that fits your intended usage and then you are taken to a “payment page” enter your credit card information and you will then pay for the image and an email will be sent to the address you use when you pay for the cartoon. Dog cartoons and pet cartoons have always been a favorite kind of cartoon to create as I am an animal lover and dog lover to be specific. More of my cartoons are available for use from within my cartoon catalogs and I will re-draw any cartoon you need to have modified. Email your business phone number and I will call you immediately to discuss anything you request. No deadline is too big or too small and I guarantee my work. Fast turn-arounds are no problem whatsoever! 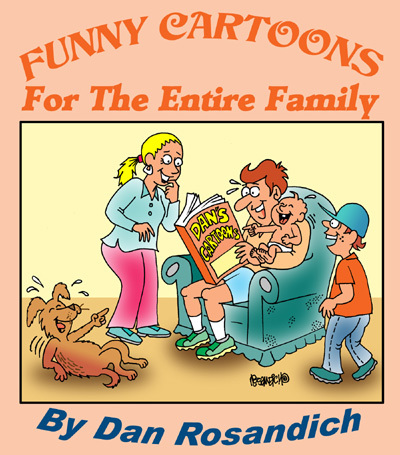 My dog and canine cartoons have appeared in newsletters, books, presentations and on apparel and I have published dog related comics for many years. I actually began creating cartoons about dogs in my earliest years of doing gag panel cartoons because there was an active publishing market for these kinds of cartoons, not to mention other “specialty” magazines relating to pets like veterinary magazines and more. If you’re a publisher, I can send you a selection of dog cartoons to consider if you contact me using my contact form or email address on my form. Thank you!